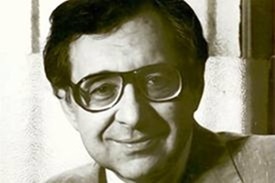 This past week, we marked the passing of Dr. Bernard Nathanson. 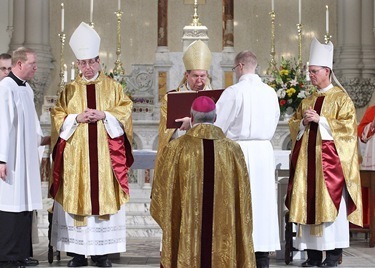 His funeral Mass was held at St. Patrick’s Cathedral in New York City. Though at one time he was a self-professed Jewish atheist and one of the architects of legalized abortion in the United States, by the end of his life he had become a Catholic and a great apostle for the Gospel of Life. 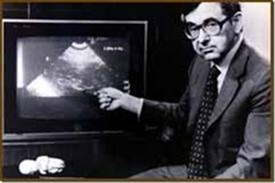 I first met him in 1979, when he had just written “Aborting America” that discussed what he called “the dishonest beginnings of the abortion movement.” At that point, he had already turned from his support of abortion and had come to a pro-life position. However, my first real contact with him came in about 1985 when friends of mine from Honduras had called to tell me there was legislation to de-penalize abortion in their country. I asked them when the new law was to go into effect, and they said it would be within a few months. My advice to them was to gather as many Catholic professionals as they could and begin to put ads on the television and radio, and write columns for the newspaper to raise awareness among the people. It was my conviction that once a law goes into effect it becomes much more difficult to change it — as we have seen in the United States. Then I called Bernard Nathanson, who was in New York at the time, and asked him to accompany me to Honduras. I explained that I was going there because my friends in the country asked if I could be of any help to them. He told me he had just had his documentary film “The Silent Scream” translated into Spanish and that he would be happy to go. We traveled to the capital, Tegucigalpa, where he addressed physicians at the university medical school and the country’s legislators. We also had him make appearances on television, and speak at rallies. I served as his translator throughout the trip. The happy ending to the story is that, ultimately, the law was repealed. Before we left Tegucigalpa, a close friend of mine who had been a parishioner of mine in Washington gave him a little crucifix. A couple of years later, I saw Bernard at pro-life meeting in Venezuela and he came over to say hello to me. The first thing he did was reach in his pocket and pull out the crucifix. He then told me that he was so grateful for that trip to Honduras, and that his only regret was that he didn’t take his wife along with him. 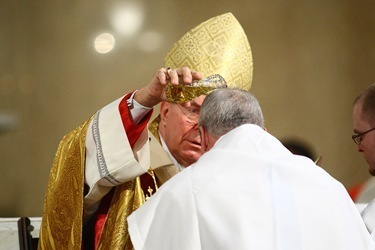 At the time, I thought “This man is on a journey of faith.” Sure enough, a few years later, in 1996, Cardinal John O’Connor received him into the Church in New York. This man who had aborted so many children and fought to legalize abortion was completely converted into a pro-life Catholic. I think there is a great lesson in that for all of us. Sometimes people in the pro-life movement lose sight of the fact that one of our goals has to be to try to lead people to the light of Christ and out of darkness. 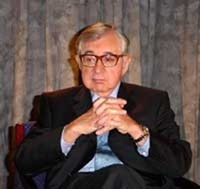 Even though some of these people may evoke such anger or disgust in us because of their positions on abortion, we must never stop praying for them, loving them and hoping they will receive the graces Bernard Nathanson received, which helped him to find the truth and discover in Christ the answer to all of the questions of his life. Also this week, I was visited at the Cathedral by relatives of Bishop Adalberto Martinez, of Guatemala. 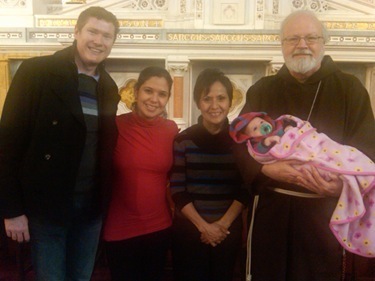 Bishop Adalberto’s sister-in-law, Alicia de Martinez, was here in the States for a visit and she came by with her daughter, son-in-law and their new baby who live here in Boston. It was wonderful to be able to see them. Then, last Monday I went to Ohio to bury my Uncle Ed, who was very close to all of us. He was my father’s brother and my last living uncle. He was a brilliant doctor, a very dedicated Catholic and a wonderful father to his family. When we were children, he was a very important part of our lives. I last talked to him on January 1st, which was his birthday. I was so happy that I was able to be there to celebrate Mass with my aunt and so many members of our family. Uncle Ed was part of what they call the “Greatest Generation”, those who came through the Great Depression and World War II. Four score year and ten is a long life, but in the case of my Uncle Ed, it was a good life. And as sad as we are to say farewell, we are filled with gratitude for the many years that we had him with us. My first memories of Uncle Eddie go back to my earliest years. Even as a child I was struck by how much Ed loved my Dad. The sense of closeness among Uncle Ed and his siblings was remarkable and something I was very aware of even as a child. I was also struck by the deep love and devotion that Uncle Ed, Bob, Marie and my Dad had towards their parents, my grandparents. For all of them Family was of paramount importance, a life-giving and joyful relationship. They enjoyed each other’s company and found strength and meaning in their close knit family. Uncle Ed was our bachelor uncle and spent a lot of quality time with us as children. He would come on Christmas Eve and put up our tree and assemble the electric train with my Dad. The only problem was, he liked the train so much, we had to fight with him to get to play with it ourselves. Uncle Ed would take us to so many interesting places. And he had a convertible. For little kids, it doesn’t get any better. We loved to listen to his stories about his time in China during the war. 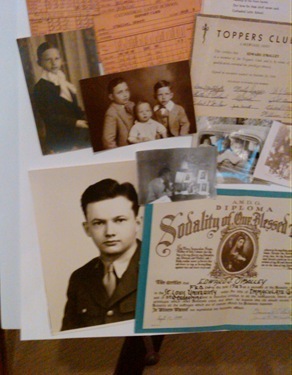 Ed was part of Tom Brokaw’s “Greatest Generation.” He completed medical school in 1943 at St. Louis University and served in the U.S. Army Medical Corps on the U.S.S. Comfort in the Pacific. Quite frankly, we were all very alarmed when we learned that Ed was going to get married. Our fears were allayed when the beautiful Therese McCrone became our new aunt. And Ed still took us to the movies and we loved to stay over at their house. For Uncle Ed, family was so important. And he loved traveling around the country with Therese and the kids in their big trailer. For Ed, being a Catholic was also about being part of a family, Christ’s family, the Church. The Mass was the center of his spiritual life, and he helped in the parish as a teacher of religious education and extraordinary minister of the Eucharist. He found meaning and purpose in the teachings of the Catholic Faith. His faith life was a journey that began on the day of his baptism and culminates in this liturgy that uses the same symbols of candle, water and the white garment. 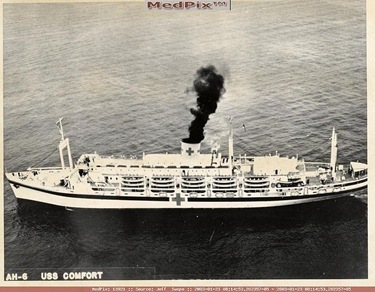 Uncle Ed lived his medical profession as a vocation of service. He was not impressed by money or prestige. He was impressed by competence and hard work. Talking with my cousins about their father, they recounted their memories of their dad always being called out in the middle of the night or on a holiday. Ed responded without delay and without complaint. He had a sense of mission and a deep concern for the people he served, and especially those who were poor or elderly. And Uncle Ed loved to debate and ruffle feathers. The last time I was with him a few months ago, for Mass at the Poor Clares on Rocky River Drive, after the Mass we gathered in the parlor of the Monastery to visit with the nuns. Uncle Ed said to the Mother Abbess, “Mother, these nuns are very happy, you can take this grill down, they are not going to escape”. That was the kind of repartee that Ed enjoyed. I have chosen this Gospel because it describes Jesus, the Divine Physician, doing house calls. His life and ministry, like our own humble lives, are full of interruptions. Jesus is on the way to cure the daughter of Jairus and he is waylaid by the old lady with the twelve year hemorrhage. According to the Mosaic law, her bleeding rendered her virtually impure and therefore she could not even go to the temple or the synagogue and left her an outcast in the community. In 12 years she spent all her money on doctors. (She did not go to Uncle Ed). Having handled the interruption, Jesus continues on His way to Jairus’ house. They told Jesus the girl had died so there was no need to come. Jesus goes anyway. He says to Jairus, “Do not be afraid, just have faith.” Jesus’ message is the same to us in our loss. We must have faith like the bleeding woman, hold onto the hem. When they arrive at the house, Jesus says, “Why are you weeping? The child is not dead, she is asleep.” It was an obvious misdiagnosis and the people laughed Jesus to scorn. Jesus cared about the people he cured, they were not just clients, or statistics, or cases, they were people…objects of Jesus’ love and mercy. Jesus prescribes food for us: the bread of life, the Eucharist. I cannot imagine my 90 year old Uncle missing Mass. He knew that whoever eats the body and blood of Christ will live forever. In today’s culture of death, ironically enough, people deny death, try to sanitize it. Jesus speaks about death as being like asleep or like a grain of wheat that falls into the ground and dies so that it can become a beautiful plant and produce much fruit. Jesus tells us that death is an invitation to live in our father’s house where there are many mansions and He says that He will come for us and carry us home. We gather here to bid farewell to someone we all loved and respected. He will be sorely missed and fondly remembered, defined by his loves. 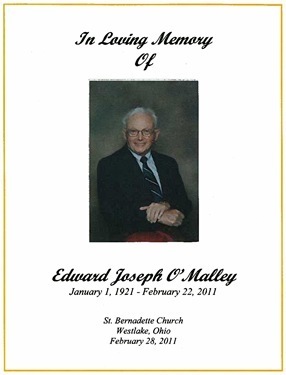 Edward O’Malley was a man who was dedicated to his Catholic Faith, his Family and his vocation to be a healer and physician. He practiced medicine everyday of his life. He was born to serve the sick, to bring them comfort and consolation. We gather here as well to pray for Ed, our faith teaches us that we must pray for the faithful departed and in every Mass we offer prayers for all of those who have gone before us marked with sign of faith, so that they be prepared to enter into God’s presence and live in His light forever. Uncle Ed, we entrust you to Mary’s kindly protection until we meet again. This Wednesday, I attended the episcopal ordination of Bishop Christopher Coyne as auxiliary bishop of the Archdiocese of Indianapolis. 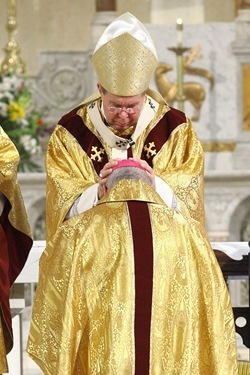 There had not been an auxiliary bishop there in 77 years. I was also so pleased that many parishioners from his former parish, St. Margaret Mary in Westwood, joined us for the Mass. In addition, about 60 Boston priests and Bishop Dooher went out for it. 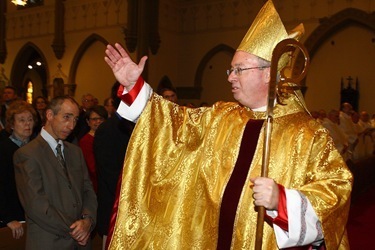 Archbishop Buechlein celebrated the Mass. 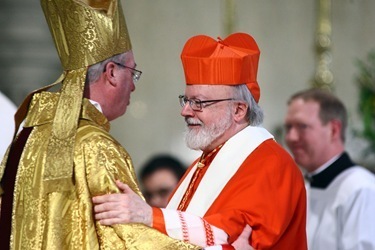 He has had some health problems and I’m sure is very happy for the assistance an auxiliary bishop will provide him. 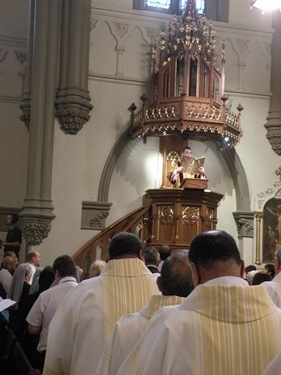 The ordination took place at St. John the Evangelist Church in Indianapolis. It was once the Pro-Cathedral. It was billed as the most beautiful church in the diocese and it really is a magnificent structure. That’s where Bishop Coyne is going to live. 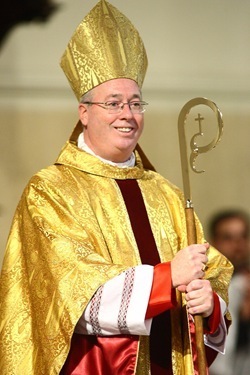 Bishop Coyne is the second Bostonian in the state because Bishop John D’Arcy was bishop up north, in Fort Wayne-South Bend. The ordination celebration was very beautiful. The singing was done by St. Meinrad’s Seminary, which also has a very large Benedictine abbey where Archbishop Buechlein had been the abbot and rector of that seminary before he became the bishop. They’re getting ready for the Super Bowl there next year, so I told Bishop Coyne the Patriots would be coming! My only previous visit there had been when I was a visitator to that seminary many years ago. 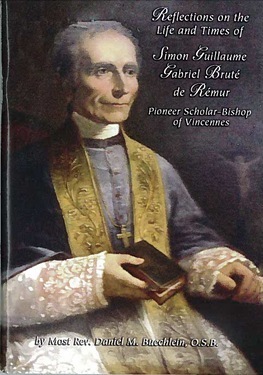 They gave us very interesting little mementos of our visit, but one I particularly latched onto was a biography Archbishop Buechlein wrote about Simon Bruté de Rémur, the pioneer scholar Bishop of Vincennes. Vincennes was the original diocese before it became Indianapolis. I saw so many parallels between his life and that of Archbishop Cheverus, who became our first bishop here. 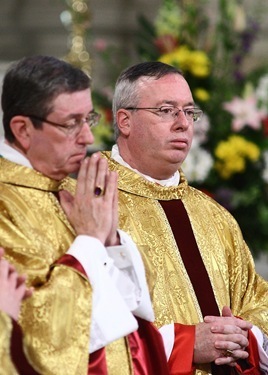 In many dioceses in the United States, the founding bishops were those priests who had come through the French Revolution and had come here as missionaries. This particular bishop’s cause has been introduced for canonization. We pray that Bishop Chris Coyne will follow in that path of sanctity and wonderful service to the people of Indianapolis!